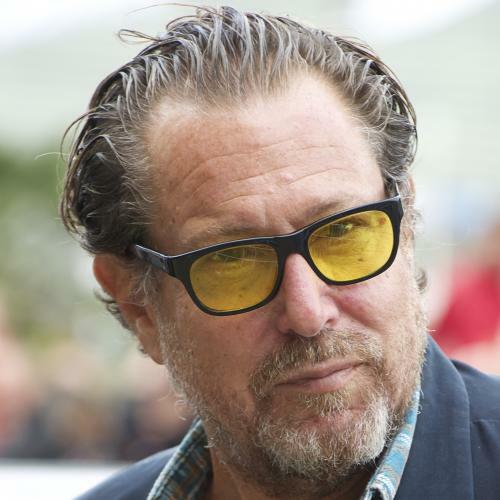 How Julian Schnabel turned bad painting into good money. At the beginning of the ’80s things are hazy in my mind. . . . I remember some guy coming up to me, I think his name was Richie or Robbie Huge. I noticed he was wearing . . . a bow tie with a black leather jacket, although the tie was almost obscured by his triple chin. He whispered in my ear, “Could we go somewhere alone? Maybe to the wine bar and talk about you—I mean your work? I’ve always intended to write about it.” I said, “Sure, let’s talk.” After some introductory flattery, his voice dropped down a tone. He whispered, “Will you chain me up?” I said, “I’m sorry Robbie, I’m not into that sort of stuff.” His reaction was one of shame inflected with hate. In his sort of cockney accent, he said you’ll pay for this one day. Reading his antisemetic [sic] babbling and personal attacks on me in Space magazine I found out he is a man of the world. Never having met Julian Schnabel, I began to wonder what were the elements from which he had concocted this “memory.” Once I had a black leather jacket, but in 1973 my motorcycle was stolen from a sidewalk in SoHo and I gave the then-useless garment away to an art historian in Worcester, Massachusetts. (Fourteen years later an old photo of me wearing it on my lost hog appeared in New York magazine, where Schnabel presumably saw it.) And to be called anti-Semitic by a man who couldn’t spell the word was weird enough, but what about those chains? I puzzled over them for days, until a friend, a scarred veteran of the psycho- analytic couch, pointed out that this mystifying passage could only record Schnabel’s own desire to “chain up”— that is, to silence—any skeptic who doubts his genius. I rang the publishers. There was a sound of foreheads being clutched. The paragraph was cut. Thus CVJ lost its one and only spicy bit, though perhaps not its only fictional one. The unexamined life, said Socrates, is not worth living. The memoirs of Julian Schnabel, such as they are, teach that the converse is also true. The unlived life is not worth examining. Writing his memoirs at 35, Schnabel has set some kind of record for premature retrospection, at least among artists. No wonder he needs to invent. “It’s sort of a cross between Charles Dickens and Gertrude Stein,” he told one reporter. But the only Steinian thing about CVJ is that it rambles, and there is nothing Dickensian about it at all. It is the art world’s answer to Vanna Speaks, without the girlish modesty. And some through the door marked Pull. As a true self-constructed American, Schnabel chose the former. He has been propelled by a manic, painfully sincere belief in his own present genius, and in his future historical importance. Between writers and readers, this lapel- grabbing has dubious value as a promotional tactic; in any case, it never works for long. (After their second books, who will persuade the discriminating reader that anything worthwhile will ever come from Jay Mclnerney, Tama Janowitz, and the other Bright Young Dwarfs of lower Manhattan, whose media-struck careers so closely resemble Schnabel’s?) But the American art system is more plagued by inflation, and more vitiated by fashion, than the American literary world. A book confers no status on its owner; a painting may. There is a crack of doubt in the soul of every collector. In it lurks the basilisk whose gaze paralyzes taste: the fear that today’s klutz may turn out to be tomorrow’s Picasso. Thus nothing except the manifestly out-of-date may be rejected with impunity. This hardy little reptile was particularly active at the moment Schnabel came on the scene. In the first half of the 1980s, riding the bull market, the demand for hot, young, new, exciting, contemporary art shot through the ceiling. All of a sudden, scores and the n hundreds of the very new rich—arbs, developers, soap-opera producers, agents, admen, all manner of important folk whose uncertainty in cultural mat- ters matched their socioeconomic vanity—decided that, being amply entitled to Everything Now, they would also be- come “major” art collectors. Most of the aspiring collectors, some of whom would duly end up on museum boards, or even with their own private museums, could not have told you the difference between a Cezanne watercolor and a drawing by Parmigianino. Their historical memory went back as far as early Warhol, where it tended to stop. Their sense of the long continuities of art was, to put it tactfully, attenuated. Insofar as they thought about the matter, they were apt to see 20th-century art history as a series of neatly packaged attacks launched at the frowning ramparts of “tradition”—first the Fauves, then the Cubists, then the Expressionists, then the Constructivists, and so on, to Abstract Expressionism and Pop. This reflex, applied to the present, meant they all bought essentially the same painting by the same artists—a herd instinct that explains the monotony to which one is condemned when passing from one new collection in Beverly Hills to the next. In the early ’80s, however the action lay with recycled Expressionism. This was where Schnabel came in. New collectors had been raised on folk-myths of the totally expressive artist as scapegoat or hero—Van Gogh and his ear. Pollock and his booze, Rothko slitting his wrists, Joseph Beuys wrapped in felt and fat beside his crashed Stuka. After the cuisine minceur of the ’70s, a time of small pebbles on floors and sheets of typing paper on gallery walls, they were aching for something hot and heavy. They got it in abundance from Schnabel’s panels encrusted with broken plates a la Gaudi and antlers a la Beuys, his heavy surfaces of tarpaulin, horsehide, and velvet choked with slimy pigment, his incoherent layering of “mythic” imagery. The art looked “radical” without being so; it was merely novel, a quality that soon outwears itself. In 1980, however, the uncertainty of new-market taste was such that if someone stood up to assert loudly and repeatedly that he was a genius, there was a chance he would be believed. This was the strategy of Schnabel and his first dealers, Mary Boone and Leo Castelli; it worked brilliantly. In fact it was a walkover, like Lawrence’s rear attack on Aqaba when the guns were all pointing out to sea. Everyone wanted a genius. In Schnabel they got the genius they deserved. But the American art world, despite its recent fixation on “irony,” does not have much sense of humor: too much is at stake to entertain the thought that a hero might be a buffoon. Like the political analysts who insisted, only a year ago, that Ronald Reagan’s “image” would never succumb to the truth of his dimwittedness, some art critics persist in treating Schnabel as though his fame were a given fact of culture, which no perception of the ineptitude of his work can alter. “No one expected him,” Thomas McEvilley pants in his essay in the catalog of the Schnabel retrospective that opened at the Whitney Museum this month. “No one knew they wanted him. Yet somehow the age demanded him... . There is nothing anyone can do about it.” The notion that this man is an emanation of the Zeitgeist matches his fantasies about himself. It even has a small truth, since only a culture as sod- den with hype as America’s in the early ’80s could have underwritten his success. Still, there are problems built into the system: its volatility, and its short memory. Given its mass-market conditions, the art world of the early ’80s closely resembled the fashion industry. Things, as it happened, went down as well as up. Careers rose like the space shuttle, amid roars of acclamation and pillars of smoke—and then, like Challenger, detonated. Who now remembers graffiti, the hot ticket of ’83? Or Jean-Michel Basquiat, who in his early 20s was being promoted as the “black Picasso” and made it onto the cover of the New York Times Magazine! Out to limbo almost all of them go, to the land of Nod, to that elephants’ graveyard of the formerly new that one imagines existing somewhere in the marshes of New Jersey, to join the second-generation acrylic-on-duck painting of the ’70s and the talking refrigerators of the ’60s: permanently remaindered. TO ESCAPE (or at least to stave off) this fate, which looms larger as the market becomes jammed with a teeming proletariat of emergent artists—a mass from which trends can be condensed more or less at will—a painter must hammer in his pitons and quickly scale the museum system: the lavishly illustrated book, the traveling retrospective. Hence the steady pressure from the market on museums to hold full-dress “retrospective” exhibitions of work by artists still in their 30s. This practice would have struck an earlier generation of American museum staff as absurd, if not macabre. The whole point of a “retrospective” used to be, first, that it was an unusual honor, setting a long-meditated and hard-won vision into the disinterested historical matrix that the museum was meant to supply, so that, second, a life’s work could be seen whole. Today you can be, like David Salle, ten years out of art school and still get your “retrospective” at the Whitney—and, in Schnabel’s case, at the Whitechapel Art Gallery in London, the Centre Pompidou in Paris, the Houston Museum of Fine Arts, and the San Francisco Museum of Modern Art as well. The tinkle of his broken plates—they have lately developed the irksome habit of falling off the paintings, so that he now employs a factotum to fly about America and glue them back on—is heard from sea to shining sea. A rum business, this end of the contemporary art market. To tease out properly its strands of idealism, fraud, sanctimony, folly, enthusiasm, and nervous bluff, to describe its machinery and the characters who tend it, would challenge the powers of Balzac or Trollope. If Schnabel, in writing his memoirs, had tried to take the reader down to the engine room, if he had written about process rather than product, he might have produced a text of some documentary interest. Alas, nothing of the kind occurred. CVJ is a celebrity bio of the most banal sort, and its writing is little more than gray grout around the big color reproductions of his pictures. made me feel like I was standing on Houston Street in late November, when the temperature has just changed; I don’t have a scarf and a friend has canceled a dinner appointment with me. I have nowhere to go. I feel the air go through me. I have a sense of my own twilight. Poor Vincent, who labored so that this Texan culture starlet, 100 years later, may feel he has forgotten his scarf and, worse, been stood up for dinner! Schnabel may feel the air go through him, but we must listen to it, flatulent self-congratulation mingled with affect-less chitchat about other artists and art people. He does not like many of them much. Clement Greenberg, “one of the most destructive, inane, positivistic, and stifling forces against the growth of art in this country,” makes a cameo appearance in the Los Angeles airport (mercifully not in black leather) so that Schnabel can preen himself on flying first class while the wicked old guru, who seems not to like his work at all, flies coach, Schnabel has no good stories. That is because he is so self-absorbed that nobody else seems altogether real. “Good conversation is scarce,” he complains, without stopping to reflect why, around him, this might be so, “and there are so few people who know how to make art.” Indeed; and one fewer than he thinks. SCHNABEL’S narrative tends toward existentialist farce, like the diary of a mooning, callow American who can’t speak any foreign languages and has discovered L’Etranger. I took a train to a public swimming pool in the suburbs of Madrid, I watched teenagers making dates for later that night, I watched families watching each other. There was no I way to enter into their lives. I went to the movies a lot. I saw Last Tango in Paris three times in the same day. In three days I had finished a bottle of Valium and in almost a week hadn’t spoken to anyone. “No way to enter into their lives.” What did he expect the Madrilenos to do, drop their babies, drag him inside, ply him with roast suckling pig? But at least his exercises in self-pity are less foolish than his claims to tragic elevation. He describes his plate-paintings in terms of “parents screaming on Kristallnacht, as their voices are lost as they were being dragged down the streets of Berlin while pieces of shattered glass glistened in the moonlight; or after some great violent act. The plates seemed to have a sound, the sound of every violent human tragedy . . . . All of this was happening before I even started to paint the painting,” One does not need to be a Jew to be repelled by Schnabel’s facile appropriation of that tragedy. If broken plates really did “mean” Kristallnacht, how could he bear to use them in his society portraits, in his crude renderings of Texan millionairesses and Beverly Hills producers? But they don’t mean anything of the sort. They are just bombast and texture—a fresh “look” that found its temporary spot in the Academy of the Briefly New, and promptly became a cliché. Never listen to anybody . . . . It’s a mistake for young artists to want to please older ones. They’re going to make you take out of your paintings the very things that most characterize them as yours, . . . You can’t listen to them because nobody knows better than you what you need to do. Most older artists are going to try to get you to conform to the standards that you are out to destroy anyway. That, in a nutshell, is why Schnabel has never learned to draw: his development was smothered by his impregnable self-esteem. IF YOU want to know what went wrong many an American art school in the ‘70s, Schnabel’s career is instructive. With scarcely an exception, every significant artist of the last hundred years, from Seurat to Matisse, from Picasso to Mondrian, from Beckmann to de Kooning, was drilled (or drilled himself) in “academic” drawing—the long tussle with the unforgiving and real motif that, in the end, proved to be one of the main bases on which the great formal achievement of Modernism could be raised. Only in this way was the right to radical distortion within a continuous tradition earned, and its results raised above the level of improvising play. This kind of rigor had been leached out of American art education by the 1970s, when Schnabel went to school in Houston, and it is quite plain from his student efforts (which are not in the Whitney’s “retrospective,” of course) that he had no talent as a formal draftsman: the weak lumpish silhouettes, the kitsch-expressionist faces with their poached-egg eyes, the clumsy line, and the inability to relate a form to the space around it by the energy of its contour were all there from the beginning. In short, because there was never a time when he could draw, there was no moment at which he jettisoned his skill in the interest of some fiction of “rawness,” or “primitive intensity.” The cack-handedness is not feigned, but real. Even when he has an original to copy, as in the Caravaggio youth with a fruit basket quoted in Exile (1980), it is done with such paint-by-numbers awkwardness as to be embarrassing. The paintings that carry some conviction are those in which Schnabel makes no attempt to draw a figure or a motif, but contents himself with a murky, nostalgic sort of Abstract Expressionist splashing; the best of these (not in the show) is Rest (1982), a brusquely painted board supported like a retable on a T-beam of wooden balks, in the Saatchi Collection in London. Schnabel is a most eclectic artist; what you see is what he was looking at last. It is bad luck that a show by Michael Tracy, an older Texan painter with whom he was associated in the ‘70s, should have opened in New York at the same time as Schnabel’s. In Tracy’s lush imagery—always on the edge of religious hysteria, choked with ex-votos riven by knives, pierced with bronze nails, and suffused by sadomasochistic references to the penitente cults of the Southwest—one sees the real condition of emotional overload that Schnabel’s work mimics but cannot make formal sense of. Likewise, his recent letterings on tarpaulin, such as Saint Ignatius Loyola (1986), are little more than replays of the work of Salvatore Scarpitta. A list of Schnabel’s “sources” would be long, as would a catalog of the images he has “appropriated” in his search for the stuff of major statements. Both, however, would be tedious. Perhaps, given the art industry’s need for dissertations that amplify the hum of myth, McEvilley’s catalog introduction will not be the last piece of prose devoted to the exegesis of Schnabel’s pictorial blather: “The brown bible wandering like a melon vine or a cancerous tumor across the page of the children’s book is the sign of involvement in natural process, of the endless growth and change of things that will not stand still for human objects.” Enough, already. The strongest symbol embedded in this conjuncture of show and book is the timing. Did the Whitney Museum and Random House really mean to celebrate Thanksgiving by serving up this turkey?